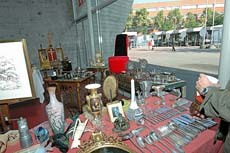 Come and enjoy the Antiques Fair and have fun searching out genuine Paris treasures. Antiques include: furniture, paintings, prints, pottery, silverware, glassware, ancient ceramics, tableware, objects of charm, old linen, and tablecloths. Coupons for free entry can be found in a lot of the newspapers given out free on the metro. When we went on Sunday there were also people handing out free entry coupons when we exited the metro at Chevalerent. There is a good selection of vendors but prices do seem fairly high. Some of my favorite items included the antique posters and vintage clothing. There are plenty of little food spots scattered throughout the where you can take a much needed break and enjoy coffee, wine or a light lunch. Events can change without notice. Please confirm all rates and details with the companies in question before you visit.